A common characteristic of play-based schools are policies discouraging adults from helping children with things they can do for themselves. 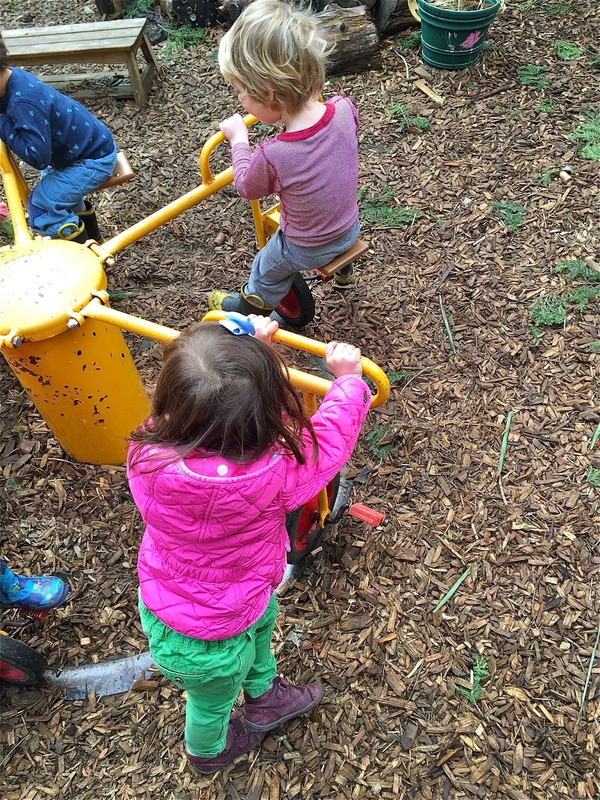 This goes for everyday personal care things like putting on jackets and using the toilet, as well as physical challenges like climbing to the top of the playhouse or using the swings. Ideally, we step back as they engage their struggles. When they begin to get frustrated, we might support them with narrative statements like, "You've put your arm in the sleeve," or perhaps helpful informative statements like, "Your other sleeve is behind you." When it's something necessary like dressing appropriately for outdoors or peeing in the potty, we then might step in with actual assistance when it appears the challenge is still too much for them, but only after giving each child a chance to do what he can for himself. When it's something with which the child is challenging herself, like climbing a tree, we might move closer and offer words of encouragement, or say things like, "I won't help you, but I won't let you get hurt." Competence is built upon perseverance and these struggles with meaningful, real-world challenges (as opposed to the manufactured challenges of tests and homework) are the foundations upon which confident, self-motivated humans are built. As a cooperative preschool in which parents work in the classroom as assistant teachers, this is one of the most important and difficult lessons some parents learn. Teachers who have never worked in a cooperative often ask me if parents "get in the way" or intervene too much or too quickly, and my answer is, "Yes, they do." When families arrive at our school with their two-year-olds, many are still brand new to the parenting game, primarily experienced in caring for infants who need so much done for them. For first time parents, that is the only parent-child relationship they know, and while there was a time when it frustrated me, I've come to realize that part of my job is to recognize where they are on their journey and to be there as they, and their child, transition into this new phase. In other words, we don't always live up to our ideal, but rather, as is the case with any ideal, we always strive in that direction. 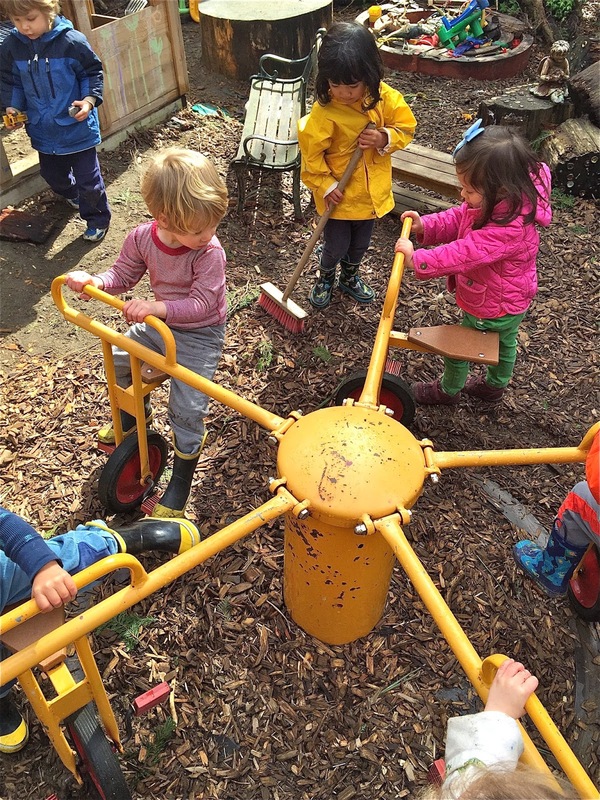 The "unicycle merry-go-round" is one of the features of our outdoor classroom. It's made to sit on a paved surface, which we had when we acquired it, but it's now installed on sloped, wood chip covered ground. 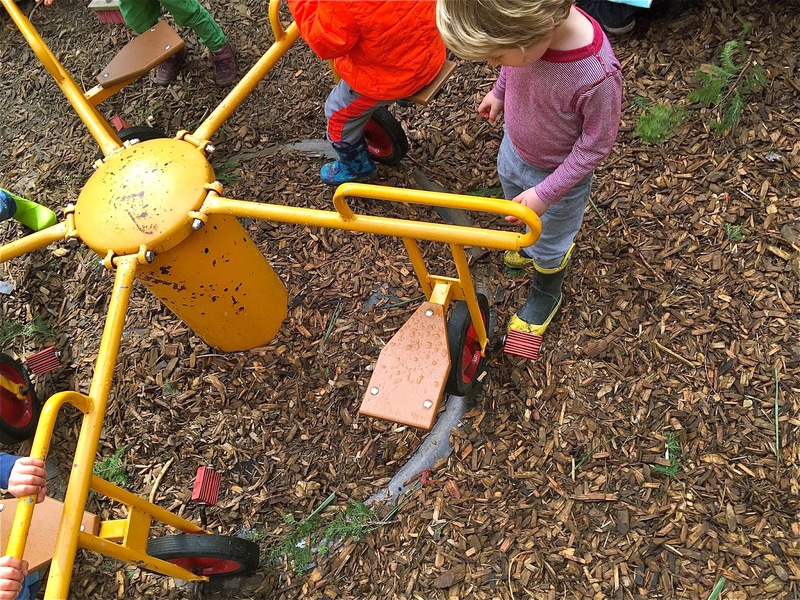 There's a "track" upon which the wheels are meant to turn, but it's almost always blocked with wood chips and other debris making it nearly impossible for children to peddle. 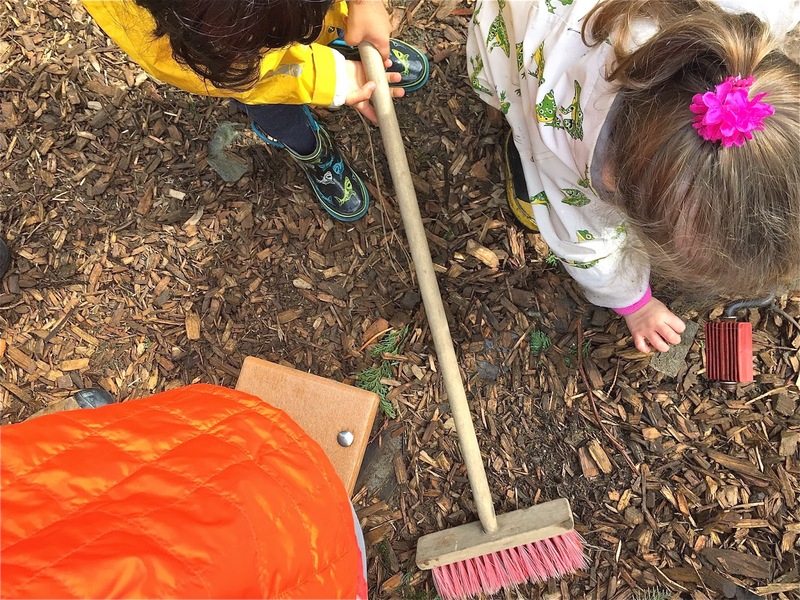 At the beginning of the school year, in our 2's class in particular, there is almost always an adult bent to the task of pushing the children. But as the months pass, it will be satisfying to watch the evidence of the progress we make along our journey. The adults will stand back without my encouragement, as children struggle with the apparatus. The kids will identify the wood chip problem themselves. They'll find the brooms to sweep the track. Some will chose to be "riders" while others will be the "motors," pushing one another around and around, taking turns by an unspoken system of their own devices, while the adults stand back, not helping, all of us striving toward our ideal.